The 2018 Deck the Hall Light Show premiered at City Hall with help from two life-sized holiday ornaments and (L to R) Bernie Prazenica, president and general manager of 6ABC; Paul Tufano, Independence executive vice president; Mayor Jim Kenney; and Paul Levy, president and CEO of Center City District. 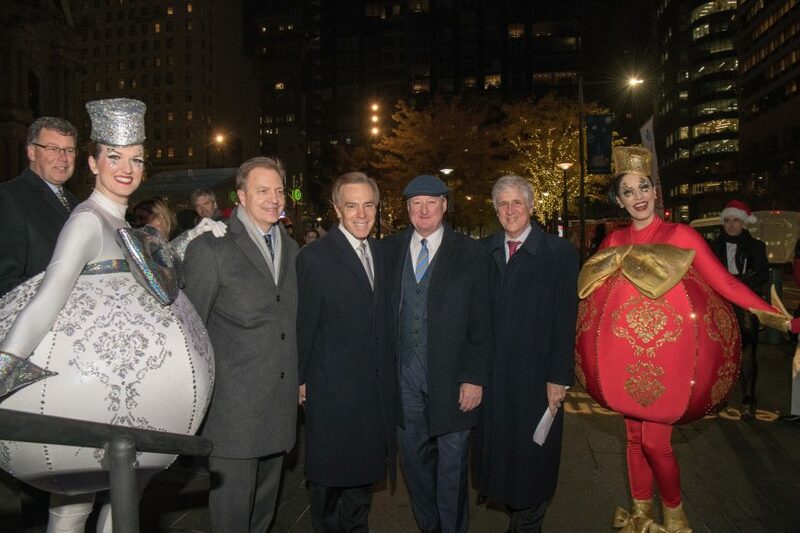 On November 19, Paul Tufano, Independence Blue Cross executive vice president, joined Philadelphia Mayor Jim Kenney, Paul Levy, president and CEO of Center City District, Bernie Prazenica, president and general manager of 6ABC, and the Philadelphia Boys Choir to kick off the holiday season at Dilworth Park with the premiere of the Deck the Hall Light Show. 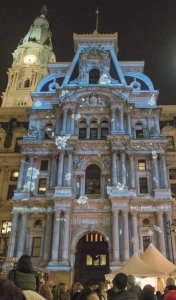 Presented by Independence Blue Cross, Deck the Hall — a free nightly choreographed light show projected on the west façade of Philadelphia’s historic City Hall and synchronized to festive holiday music — will run through January 1, 2019. Daily, the show kicks off at 5:30 p.m. and the last show starts at 8:30 p.m. Visitors to Dilworth Park can also visit the Wintergarden, shop for locally made gifts and food in the Made in Philadelphia Holiday Market, and ice skate.